Sicily is well known for its wonderful food which stems from the quality of the ingredients, which are, wherever possible, locally grown or reared and always follow the seasons, making them particularly fresh and tasty. Think plump olives, sun-ripened tomatoes, nuts and mushrooms, succulent meats, tasty cheeses and a bountiful supply of locally caught fish and seafood. Not to mention the full-bodied wines made from grapes grown on the volcanic soils of Mount Etna. The other single major factor that has most greatly influenced the cuisine of the island is the absorption of some of the world’s most famous culinary traditions of the people that have governed the island throughout its turbulent history including the Arabs, French, Spanish and of course, the Southern Italians, resulting in a colourful and varied cuisine. 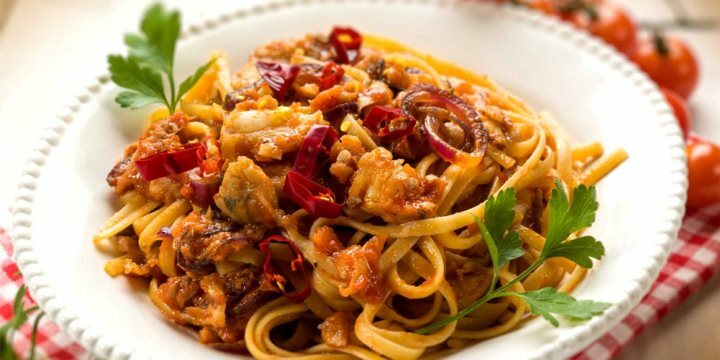 Here are just a few of our favourite dishes to look out for starting with Pasta con le Sarde (pasta with sardines, anchovies, fennel, sultanas, pine nuts and a pinch of saffron); Sicilian ingredients with a touch of the exotic. Then there’s the Spanish influenced Impanata di Pesce Spada (swordfish pie) and the Arab influenced, Cùscusu made from pellets of couscous steamed over fish broth and served with prawns or small fish. 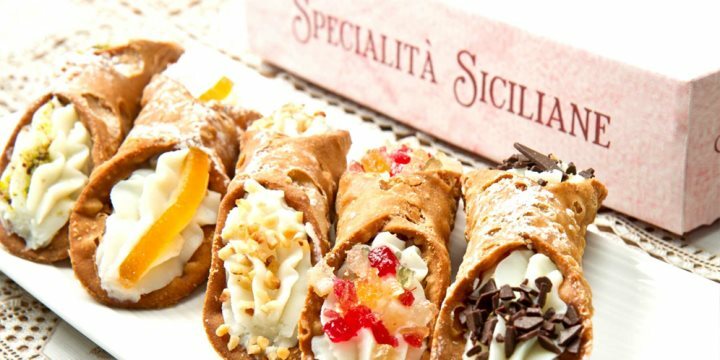 Sicilian desserts are legendary, the most well-known being Cannoli, a fried tube of pastry filled with sweet ricotta cheese, decorated with candied fruit and chocolate, which dates back to the Middle Ages. On a hot day try a refreshing Granita, a simple mix of granulated ice with sugar and fresh fruits, invented in Sicily but now popular throughout Italy. Sicily, and in particular Palermo, is also renowned for its street food. Don’t miss the Arancine (see below) or the Panelle (chickpea fritters). And be sure to try some Tavola Calda, a term used for the extremely moreish savoury snacks found in huge variety in bakeries, bars and cafes throughout the island. 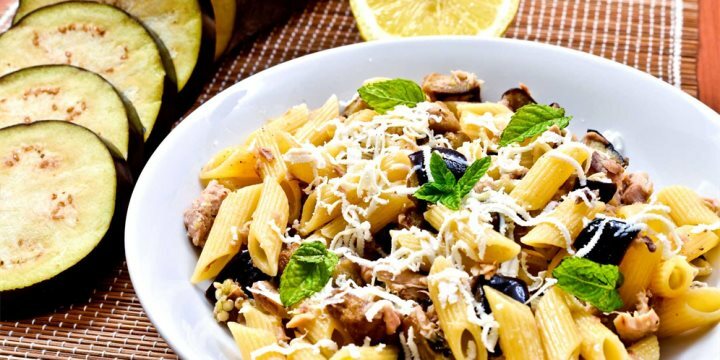 Vegetarians are well catered for on the island and a Sicilian favourite to look out for is Pasta alla Norma. From eastern Sicily, it’s made with fried eggplant, tomatoes, herbs and ricotta. A point to note, however, be sure to explain that as well as not eating meat, you do not eat cold, sliced meats such as ham and to be on the safe side mention that neither do you eat poultry, fish or seafood. • Arancini (stuffed rice balls): In Palermo the street food is called arancina/arancine whereas in Catania it is nown as arancino/arancini. Both made with a meat and tomato sauce however in Palermo it is not called a ragu instead it is sugo and it’s a more like Bolognese whereas in Catania its a hunk of beef with cheese and tomato. The shape is also different, in Palermo arancine is round to look more like oranges - the Italian word for orange is arancia - Whereas in Catania arrancini is conical to reflect Etna with the tomato representing lava. You can also get arancini with a number of other fillings: Bianco - with a beschamel sauce sometimes with ham, or Spinaci (spinach). Catanese is made with aubergine instead of meat. Some restaurants will have Nero di Sepia arancini or arancini Salmone - salmon and hollandaise sauce. • Parmigiana: A starter,like lasagne but instead of pasta it is slices of fried aubergine layered with a tomato sauce and cheese, served hot or cold depending on the restaurant. • Caponata: A typical Sicilian dish with aubergine, tomatoes, onions, capers, pine nuts, basil, raisins and red wine or balsamic vinegar, all slow cooked making a lovely vegetable side dish with a sweet/sour spin. Every Italian Mama has her own version of this ie: peppers instead of aubergine, sometimes called peperonata. • Involtini di Melanzane/Pesce Spada: Involtini basically means little rolls, so the main ingredient e.g swordfish or aubergine is cut into thin slices and lightly fried, stuffed with cheese or meat or spices or all three and then rolled. It's then covered in breadcrumbs and fried in oil or baked in a tomato sauce depending on the chef. • Spaghetti al Nero di Seppia (squid Ink pasta): This is a famous dish in Sicily and you will find it on many menus..! Or Spaghetti alle Vongole: A really simple and popular pasta dish with clam oil, garlic, parsley, and white wine. 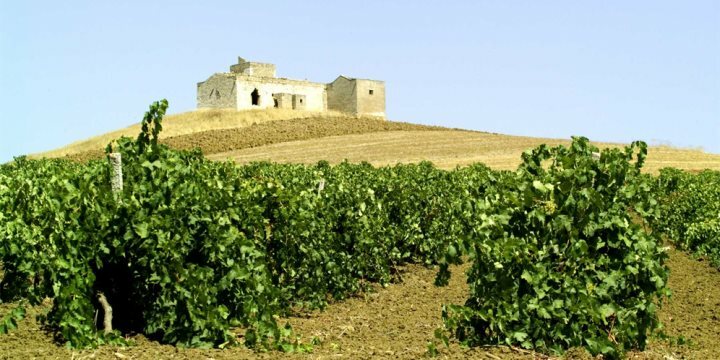 Sicily is one of the oldest wine producing areas of the world. Today, Sicily’s wine scene is flourishing, with many fine wines being produced throughout the island and numerous tasting opportunities (cantines). Sicily is perhaps best known for Marsala, a fortified wine from the west of the island. It was first produced in the late 19th century and was an immediate hit. However, it fell out of favour in the 1950s when it was relegated to the kitchen. In recent years, with stricter rules regulating its production, Marsala, is once again becoming popular. There are three different levels of sweetness, and it is a good choice with cheese, dessert, or an aperitif. • Nero D’Avola is an important Sicilian red, named after the town of Avola. Fruity & rich, the best of this wine is produced in the Syracuse region and it is an ideal accompaniment to meat dishes. • For Chardonnay grapes, Sicily has the perfect environment and today most vineries produce high quality Chardonnay. this wine is great with fish or as an aperitif. • Passito di Pantelleria is an excellent sweet wine made from dried grapes fown on the island of Pantelleria. This wine is perfect with dessert. There are a number of sweet/dessert wines from sicily. Try also Vino alla mandorla or Zibbibo. As well as the familiar Italian favourites, limoncello (lemon), anisette, amaretto (almond), Sicily produces some excellent and unique liqueurs including Ala, Averna (made in Caltanissetta) and Fichera. Grappa, which is actually a type of white brandy, is a popular digestive, after dinner drink. Seltz is a traditional drink made with fresh lemon and soda water and sold in kiosks in Catania - sometimes the Italians have it with salt ‘una seltza limone senza sale per favore’ is the way to ask for it, or you can have it with lemon/orange/strawberry syrup, fresh lemon and soda water. There are many different syrups to choose from! • Fuoco dell’etna is found in most of the souvenir shops. It is very strong, like a Sicilian version of absinthe. • Rosolio alla Cannella - A cinnamon liquor. 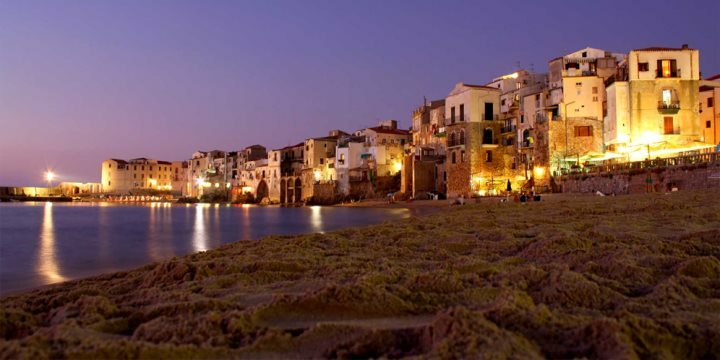 A typical way for an Italian to spend an evening is chatting with family and friends over a leisurely meal in a restaurant or pavement café and that certainly holds true for Sicily. If you are after something a little more lively, however, Palermo, Taormina, Syracuse and Catania, all have a great choice of bars and clubs, as well as restaurants. And don’t forget the myriad of festivals throughout the year, often with fireworks, live music and plenty of eating and drinking throughout. The World Festival on the Beach held in Mondello, Palmero each May, is a wonderful mix of water sports and music. While the Ypsigrock Music Festival is an indie rock music festival in the stunning setting of the castle in Castelbuono held each August. You’ll find plenty more to choose from to suit every taste on our Festivals of Sicily page.